"Big splash" redirects here. For other uses, see Big Splash (disambiguation). The giant-impact hypothesis, sometimes called the Big Splash, or the Theia Impact suggests that the Moon formed out of the debris left over from a collision between Earth and an astronomical body the size of Mars, approximately 4.5 billion years ago, in the Hadean eon; about 20 to 100 million years after the Solar System coalesced. The colliding body is sometimes called Theia, from the name of the mythical Greek Titan who was the mother of Selene, the goddess of the Moon. Analysis of lunar rocks, published in a 2016 report, suggests that the impact may have been a direct hit, causing a thorough mixing of both parent bodies. Earth's spin and the Moon's orbit have similar orientations. Moon samples indicate that the Moon's surface was once molten. However, there remain several questions concerning the best current models of the giant-impact hypothesis. The energy of such a giant impact is predicted to have heated Earth to produce a global magma ocean, and evidence of the resultant planetary differentiation of the heavier material sinking into Earth's mantle has been documented. However, as of 2015[update] there is no self-consistent model that starts with the giant-impact event and follows the evolution of the debris into a single moon. Other remaining questions include when the Moon lost its share of volatile elements and why Venus—which experienced giant impacts during its formation—does not host a similar moon. In 1898, George Darwin made the suggestion that the Earth and Moon were once a single body. Darwin's hypothesis was that a molten Moon had been spun from the Earth because of centrifugal forces, and this became the dominant academic explanation. Using Newtonian mechanics, he calculated that the Moon had orbited much more closely in the past and was drifting away from the Earth. This drifting was later confirmed by American and Soviet experiments, using laser ranging targets placed on the Moon. Nonetheless, Darwin's calculations could not resolve the mechanics required to trace the Moon backward to the surface of the Earth. In 1946, Reginald Aldworth Daly of Harvard University challenged Darwin's explanation, adjusting it to postulate that the creation of the Moon was caused by an impact rather than centrifugal forces. Little attention was paid to Professor Daly's challenge until a conference on satellites in 1974, during which the idea was reintroduced and later published and discussed in Icarus in 1975 by Drs. William K. Hartmann and Donald R. Davis. Their models suggested that, at the end of the planet formation period, several satellite-sized bodies had formed that could collide with the planets or be captured. They proposed that one of these objects may have collided with the Earth, ejecting refractory, volatile-poor dust that could coalesce to form the Moon. This collision could potentially explain the unique geological and geochemical properties of the Moon. A similar approach was taken by Canadian astronomer Alastair G. W. Cameron and American astronomer William R. Ward, who suggested that the Moon was formed by the tangential impact upon Earth of a body the size of Mars. It is hypothesized that most of the outer silicates of the colliding body would be vaporized, whereas a metallic core would not. Hence, most of the collisional material sent into orbit would consist of silicates, leaving the coalescing Moon deficient in iron. The more volatile materials that were emitted during the collision probably would escape the Solar System, whereas silicates would tend to coalesce. The name of the hypothesized protoplanet is derived from the mythical Greek titan Theia /ˈθiːə/, who gave birth to the Moon goddess Selene. This designation was proposed initially by the English geochemist Alex N. Halliday in 2000 and has become accepted in the scientific community. According to modern theories of planet formation, Theia was part of a population of Mars-sized bodies that existed in the Solar System 4.5 billion years ago. 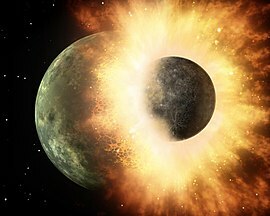 One of the attractive features of the giant-impact hypothesis is that the formation of the Moon and Earth align; during the course of its formation, the Earth is thought to have experienced dozens of collisions with planet-sized bodies. The Moon-forming collision would have been only one such "giant impact" but certainly the last significant impactor event. The Late Heavy Bombardment by much smaller asteroids occurred later - approximately 3.9 billion years ago. Simplistic representation of the giant-impact hypothesis. Astronomers think the collision between Earth and Theia happened at about 4.4 to 4.45 bya; about 0.1 billion years after the Solar System began to form. In astronomical terms, the impact would have been of moderate velocity. Theia is thought to have struck the Earth at an oblique angle when the Earth was nearly fully formed. Computer simulations of this "late-impact" scenario suggest an impact angle of about 45° and an initial impactor velocity below 4 km/s. However, oxygen isotope abundance in lunar rock suggests "vigorous mixing" of Theia and Earth, indicating a steep impact angle. Theia's iron core would have sunk into the young Earth's core, and most of Theia's mantle accreted onto the Earth's mantle. However, a significant portion of the mantle material from both Theia and the Earth would have been ejected into orbit around the Earth (if ejected with velocities between orbital velocity and escape velocity) or into individual orbits around the Sun (if ejected at higher velocities). The material in orbits around the Earth quickly coalesced into the Moon (possibly within less than a month, but in no more than a century). The material in orbits around the sun stayed on its Kepler orbits, which are stable in space, and was thus likely to hit the earth-moon system sometime later (because the Earth-Moon system's Kepler orbit around the sun also remains stable). Estimates based on computer simulations of such an event suggest that some twenty percent of the original mass of Theia would have ended up as an orbiting ring of debris around the Earth, and about half of this matter coalesced into the Moon. The Earth would have gained significant amounts of angular momentum and mass from such a collision. Regardless of the speed and tilt of the Earth's rotation before the impact, it would have experienced a day some five hours long after the impact, and the Earth's equator and the Moon's orbit would have become coplanar. Not all of the ring material need have been swept up right away: the thickened crust of the Moon's far side suggests the possibility that a second moon about 1,000 km in diameter formed in a Lagrange point of the Moon. The smaller moon may have remained in orbit for tens of millions of years. As the two moons migrated outward from the Earth, solar tidal effects would have made the Lagrange orbit unstable, resulting in a slow-velocity collision that "pancaked" the smaller moon onto what is now the far side of the Moon, adding material to its crust. Lunar magma cannot pierce through the thick crust of the far side, causing lesser lunar maria, while the near side has a thin crust displaying the large maria visible from Earth. In 2001, a team at the Carnegie Institution of Washington reported that the rocks from the Apollo program carried an isotopic signature that was identical with rocks from Earth, and were different from almost all other bodies in the Solar System. In 2014, a team in Germany reported that the Apollo samples had a slightly different isotopic signature from Earth rocks. The difference was slight, but statistically significant. One possible explanation is that Theia formed near the Earth. This empirical data showing close similarity of composition can only be explained by the standard giant-impact hypothesis as an extremely unlikely coincidence, where the two bodies prior to collision somehow had a similar composition. However in science, a very low probability of a situation points toward an error in theory, so effort has been focused on modifying the theory in order to better explain this fact that the Earth and Moon are composed of nearly the same type of rock. In 2007, researchers from the California Institute of Technology showed that the likelihood of Theia having an identical isotopic signature as the Earth was very small (less than 1 percent). They proposed that in the aftermath of the giant impact, while the Earth and the proto-lunar disk were molten and vaporized, the two reservoirs were connected by a common silicate vapor atmosphere and that the Earth– Moon system became homogenized by convective stirring while the system existed in the form of a continuous fluid. Such an "equilibration" between the post-impact Earth and the proto-lunar disk is the only proposed scenario that explains the isotopic similarities of the Apollo rocks with rocks from the Earth's interior. For this scenario to be viable, however, the proto-lunar disk would have to endure for about 100 years. Work is ongoing to determine whether or not this is possible. One effort to homogenize the products of the collision was to energize the primary body by way of a greater pre-collision rotational speed. This way, more material from the primary body would be spun off to form the moon. Further computer modelling determined that the observed result could be obtained by having the pre-Earth body spinning very rapidly, so much so that it formed a new celestial object which was given the name 'synestia'. This is an unstable state that could have been generated by yet another collision to get the rotation spinning fast enough. Further modelling of this transient structure has shown that the primary body spinning as a doughnut-shaped object (the synestia) existed for about a century (a very short time) before it cooled down and gave birth to the Earth and the Moon. Indirect evidence for the giant impact scenario comes from rocks collected during the Apollo Moon landings, which show oxygen isotope ratios nearly identical to those of Earth. The highly anorthositic composition of the lunar crust, as well as the existence of KREEP-rich samples, suggest that a large portion of the Moon once was molten; and a giant impact scenario could easily have supplied the energy needed to form such a magma ocean. Several lines of evidence show that if the Moon has an iron-rich core, it must be a small one. In particular, the mean density, moment of inertia, rotational signature, and magnetic induction response of the Moon all suggest that the radius of its core is less than about 25% the radius of the Moon, in contrast to about 50% for most of the other terrestrial bodies. Appropriate impact conditions satisfying the angular momentum constraints of the Earth– Moon system yield a Moon formed mostly from the mantles of the Earth and the impactor, while the core of the impactor accretes to the Earth. It is noteworthy that the Earth has the highest density of all the planets in the Solar System; the absorption of the core of the impactor body explains this observation, given the proposed properties of the early Earth and Theia. Comparison of the zinc isotopic composition of lunar samples with that of Earth and Mars rocks provides further evidence for the impact hypothesis. Zinc is strongly fractionated when volatilized in planetary rocks, but not during normal igneous processes, so zinc abundance and isotopic composition can distinguish the two geological processes. Moon rocks contain more heavy isotopes of zinc, and overall less zinc, than corresponding igneous Earth or Mars rocks, which is consistent with zinc being depleted from the Moon through evaporation, as expected for the giant impact origin. Collisions between ejecta escaping Earth's gravity and asteroids would have left impact heating signatures in stony meteorites; analysis based on assuming the existence of this effect has been used to date the impact event to 4.47 billion years ago, in agreement with the date obtained by other means. Warm silica-rich dust and abundant SiO gas, products of high velocity (> 10 km/s) impacts between rocky bodies, have been detected by the Spitzer Space Telescope around the nearby (29 pc distant) young (~12 My old) star HD172555 in the Beta Pictoris moving group. A belt of warm dust in a zone between 0.25AU and 2AU from the young star HD 23514 in the Pleiades cluster appears similar to the predicted results of Theia's collision with the embryonic Earth, and has been interpreted as the result of planet-sized objects colliding with each other. A similar belt of warm dust was detected around the star BD +20°307 (HIP 8920, SAO 75016). This lunar origin hypothesis has some difficulties that have yet to be resolved. For example, the giant-impact hypothesis implies that a surface magma ocean would have formed following the impact. Yet there is no evidence that the Earth ever had such a magma ocean and it is likely there exists material that has never been processed in a magma ocean. A number of compositional inconsistencies need to be addressed. The ratios of the Moon's volatile elements are not explained by the giant-impact hypothesis. If the giant-impact hypothesis is correct, they must be due to some other cause. The presence of volatiles such as water trapped in lunar basalts is more difficult to explain if the Moon was caused by a high-temperature impact. The iron oxide (FeO) content (13%) of the Moon, intermediate between that of Mars (18%) and the terrestrial mantle (8%), rules out most of the source of the proto-lunar material from the Earth's mantle. If the bulk of the proto-lunar material had come from an impactor, the Moon should be enriched in siderophilic elements, when, in fact, it is deficient in those. The Moon's oxygen isotopic ratios are essentially identical to those of Earth. Oxygen isotopic ratios, which may be measured very precisely, yield a unique and distinct signature for each solar system body. If a separate proto-planet Theia had existed, it probably would have had a different oxygen isotopic signature than Earth, as would the ejected mixed material. The Moon's titanium isotope ratio (50Ti/47Ti) appears so close to the Earth's (within 4 ppm), that little if any of the colliding body's mass could likely have been part of the Moon. If the Moon was formed by such an impact, it is possible that other inner planets also may have been subjected to comparable impacts. A moon that formed around Venus by this process would have been unlikely to escape. If such a moon-forming event had occurred there, a possible explanation of why the planet does not have such a moon might be that a second collision occurred that countered the angular momentum from the first impact. Another possibility is that the strong tidal forces from the Sun would tend to destabilize the orbits of moons around close-in planets. For this reason, if Venus's slow rotation rate began early in its history, any satellites larger than a few kilometers in diameter would likely have spiraled inwards and collided with Venus. Simulations of the chaotic period of terrestrial planet formation suggest that impacts like those hypothesized to have formed the Moon were common. For typical terrestrial planets with a mass of 0.5 to 1 Earth masses, such an impact typically results in a single moon containing 4% of the host planet's mass. The inclination of the resulting moon's orbit is random, but this tilt affects the subsequent dynamic evolution of the system. For example, some orbits may cause the moon to spiral back into the planet. Likewise, the proximity of the planet to the star will also affect the orbital evolution. The net effect is that it is more likely for impact-generated moons to survive when they orbit more distant terrestrial planets and are aligned with the planetary orbit. One suggested pathway for the Big Splash as viewed from the direction of the south pole (not to scale). In 2004, Princeton University mathematician Edward Belbruno and astrophysicist J. Richard Gott III proposed that Theia coalesced at the L4 or L5 Lagrangian point relative to Earth (in about the same orbit and about 60° ahead or behind), similar to a trojan asteroid. Two-dimensional computer models suggest that the stability of Theia's proposed trojan orbit would have been affected when its growing mass exceeded a threshold of approximately 10% of the Earth's mass (the mass of Mars). In this scenario, gravitational perturbations by planetesimals caused Theia to depart from its stable Lagrangian location, and subsequent interactions with proto-Earth led to a collision between the two bodies. In 2008, evidence was presented that suggests that the collision may have occurred later than the accepted value of 4.53 Gya, at approximately 4.48 Gya. A 2014 comparison of computer simulations with elemental abundance measurements in the Earth's mantle indicated that the collision occurred approximately 95 My after the formation of the Solar System. It has been suggested that other significant objects may have been created by the impact, which could have remained in orbit between the Earth and Moon, stuck in Lagrangian points. Such objects may have stayed within the Earth–Moon system for as long as 100 million years, until the gravitational tugs of other planets destabilized the system enough to free the objects. A study published in 2011 suggested that a subsequent collision between the Moon and one of these smaller bodies caused the notable differences in physical characteristics between the two hemispheres of the Moon. This collision, simulations have supported, would have been at a low enough velocity so as not to form a crater; instead, the material from the smaller body would have spread out across the Moon (in what would become its far side), adding a thick layer of highlands crust. The resulting mass irregularities would subsequently produce a gravity gradient that resulted in tidal locking of the Moon so that today, only the near side remains visible from Earth. However, mapping by the GRAIL mission has apparently ruled out this scenario. The giant-impact hypothesis fails to properly explain the similar composition of Earth and the Moon. Especially, the indistinguishable relation of oxygen isotopes cannot be explained by the classical form of this hypothesis. According to research on the subject that is based on new simulations at the University of Bern by physicist Andreas Reufer and his colleagues, Theia collided directly with Earth instead of barely swiping it. The collision speed may have been higher than originally assumed, and this higher velocity may have totally destroyed Theia. According to this modification, the composition of Theia is not so restricted, making a composition of up to 50% water ice possible. Other mechanisms that have been suggested at various times for the Moon's origin are that the Moon was spun off from the Earth's molten surface by centrifugal force; that it was formed elsewhere and was subsequently captured by the Earth's gravitational field; or that the Earth and the Moon formed at the same time and place from the same accretion disk. None of these hypotheses can account for the high angular momentum of the Earth–Moon system. Another hypothesis attributes the formation of the Moon to the impact of a large asteroid with the Earth much later than previously thought, creating the satellite primarily from debris from Earth. In this hypothesis, the formation of the Moon occurs 60–140 million years after the formation of the Solar System. Previously, the age of the Moon had been thought to be 4.527 ± 0.010 billion years. The impact in this scenario would have created a magma ocean on Earth and the proto-Moon with both bodies sharing a common plasma metal vapor atmosphere. The shared metal vapor bridge would have allowed material from the Earth and proto-Moon to exchange and equilibrate into a more common composition. Yet another hypothesis proposes that the Moon and the Earth have formed together instead of separately like the giant-impact hypothesis suggests. The new model, developed by Robin M. Canup, suggests that the Moon and the Earth have formed as a part of a massive collision of two planetary bodies, each larger than Mars, which then re-collided to form what we now call Earth. After the recollision, Earth was surrounded by a disk of material, which accreted to form the Moon. This hypothesis could explain facts that others do not. ^ "Revisiting the Moon". The New York Times. 2014-09-09. ^ a b Halliday, Alex N. (February 28, 2000). "Terrestrial accretion rates and the origin of the Moon". Earth and Planetary Science Letters. 176 (1): 17–30. Bibcode:2000E&PSL.176...17H. doi:10.1016/S0012-821X(99)00317-9. ^ a b Young, Edward D.; Kohl, Issaku E.; Warren, Paul H.; Rubie, David C.; Jacobson, Seth A.; Morbidelli, Alessandro (2016-01-29). "Oxygen isotopic evidence for vigorous mixing during the Moon-forming giant impact". Science. 351 (6272): 493–496. arXiv:1603.04536. Bibcode:2016Sci...351..493Y. doi:10.1126/science.aad0525. ISSN 0036-8075. PMID 26823426. ^ a b Canup, R.; Asphaug, E. (2001). "Origin of the Moon in a giant impact near the end of the Earth's formation" (PDF). Nature. 412 (6848): 708–712. Bibcode:2001Natur.412..708C. doi:10.1038/35089010. PMID 11507633. Archived from the original (PDF) on 2010-07-30. Retrieved 2011-12-10. ^ a b Mackenzie, Dana (2003). The Big Splat, or How The Moon Came To Be. John Wiley & Sons. ISBN 978-0-471-15057-2. ^ a b c Wiechert, U.; et al. (October 2001). "Oxygen Isotopes and the Moon-Forming Giant Impact". Science. 294 (12): 345–348. Bibcode:2001Sci...294..345W. doi:10.1126/science.1063037. PMID 11598294. Retrieved 2009-07-05. ^ Daniel Clery (11 October 2013). "Impact Theory Gets Whacked". Science. 342 (6155): 183–5. Bibcode:2013Sci...342..183C. doi:10.1126/science.342.6155.183. PMID 24115419. ^ Rubie, D. C.; Nimmo, F.; Melosh, H. J. (2007-01-01). Formation of Earth's Core A2 - Schubert, Gerald. Amsterdam: Elsevier. pp. 51–90. ISBN 9780444527486. ^ a b Binder, A. B. (1974). "On the origin of the Moon by rotational fission". The Moon. 11 (2): 53–76. Bibcode:1974Moon...11...53B. doi:10.1007/BF01877794. ^ Daly, Reginald A. (1946). "Origin of the Moon and Its Topography". PAPS. 90 (2): 104–119. JSTOR 3301051. ^ Hartmann, W. K.; Davis, D. R. (April 1975). "Satellite-sized planetesimals and lunar origin". Icarus. 24 (4): 504–514. Bibcode:1975Icar...24..504H. doi:10.1016/0019-1035(75)90070-6. ^ Cameron, A. G. W.; Ward, W. R. (March 1976). "The Origin of the Moon". Abstracts of the Lunar and Planetary Science Conference. 7: 120–122. Bibcode:1976LPI.....7..120C. ^ Freeman, David (2013-09-23). "How Old Is The Moon? 100 Million Years Younger Than Once Thought, New Research Suggests". The Huffington Post. Retrieved 2013-09-25. ^ Soderman. "Evidence for Moon-Forming Impact Found Inside Meteorites". NASA-SSERVI. Retrieved 7 July 2016. ^ "The Earth and Moon Both Contain Equal Parts of an Ancient Planet". Popular Mechanics. 2016-01-28. Retrieved 2016-04-30. ^ a b Stevenson, D. J. (1987). "Origin of the moon–The collision hypothesis". Annual Review of Earth and Planetary Sciences. 15 (1): 271–315. Bibcode:1987AREPS..15..271S. doi:10.1146/annurev.ea.15.050187.001415. ^ Richard Lovett (2011-08-03). "Early Earth may have had two moons". Nature.com. Retrieved 2013-09-25. ^ "Was our two-faced moon in a small collision?". Theconversation.edu.au. Retrieved 2013-09-25. ^ Herwartz, D.; Pack, A.; Friedrichs, B.; Bischoff, A. (2014). "Identification of the giant impactor Theia in lunar rocks". Science. 344 (6188): 1146–50. Bibcode:2014Sci...344.1146H. doi:10.1126/science.1251117. PMID 24904162. ^ "Traces of another world found on the Moon". BBC News. 2014-06-06. ^ Pahlevan, Kaveh; Stevenson, David (October 2007). "Equilibration in the Aftermath of the Lunar-forming Giant Impact". Earth and Planetary Science Letters. 262 (3–4): 438–449. arXiv:1012.5323. Bibcode:2007E&PSL.262..438P. doi:10.1016/j.epsl.2007.07.055. ^ Boyle, Rebecca. "Huge impact could have smashed early Earth into a doughnut shape". New Scientist. Retrieved 7 June 2017. ^ Lock, Simon J.; Stewart, Sarah T.; Petaev, Michail I.; Leinhardt, Zoe M.; Mace, Mia T.; Jacobsen, Stein B.; Ćuk, Matija (2018). "The origin of the Moon within a terrestrial synestia". Journal of Geophysical Research. 123 (4): 910. arXiv:1802.10223. Bibcode:2018JGRE..123..910L. doi:10.1002/2017JE005333. ^ a b Paniello, R. C.; Day, J. M. D.; Moynier, F. (2012). "Zinc isotopic evidence for the origin of the Moon". Nature. 490 (7420): 376–379. Bibcode:2012Natur.490..376P. doi:10.1038/nature11507. PMID 23075987. ^ Moynier, F.; Albarède, F.; Herzog, G. F. (2006). "Isotopic composition of zinc, copper, and iron in lunar samples". Geochimica et Cosmochimica Acta. 70 (24): 6103. Bibcode:2006GeCoA..70.6103M. doi:10.1016/j.gca.2006.02.030. ^ Moynier, F.; Beck, P.; Jourdan, F.; Yin, Q. Z.; Reimold, U.; Koeberl, C. (2009). "Isotopic fractionation of zinc in tektites". Earth and Planetary Science Letters. 277 (3–4): 482. Bibcode:2009E&PSL.277..482M. doi:10.1016/j.epsl.2008.11.020. hdl:20.500.11937/39896. ^ Ben Othman, D.; Luck, J. M.; Bodinier, J. L.; Arndt, N. T.; Albarède, F. (2006). "Cu–Zn isotopic variations in the Earth's mantle". Geochimica et Cosmochimica Acta. 70 (18): A46. Bibcode:2006GeCAS..70...46B. doi:10.1016/j.gca.2006.06.201. ^ Bottke, W. F.; Vokrouhlicky, D.; Marchi, S.; Swindle, T.; Scott, E. R. D.; Weirich, J. R.; Levison, H. (2015). "Dating the Moon-forming impact event with asteroidal meteorites". Science. 348 (6232): 321–3. Bibcode:2015Sci...348..321B. doi:10.1126/science.aaa0602. PMID 25883354. ^ Lisse, Carey M.; et al. (2009). "Abundant Circumstellar Silica Dust and SiO Gas Created by a Giant Hypervelocity Collision in the ~12 Myr HD172555 System". Astrophysical Journal. 701 (2): 2019–2032. arXiv:0906.2536. Bibcode:2009ApJ...701.2019L. doi:10.1088/0004-637X/701/2/2019. ^ Rhee, Joseph H.; Song, Inseok; Zuckerman, B. (2007). "Warm dust in the terrestrial planet zone of a sun-like Pleiad: collisions between planetary embryos?". Astrophysical Journal. 675 (1): 777–783. arXiv:0711.2111v1. Bibcode:2008ApJ...675..777R. doi:10.1086/524935. ^ Song, Inseok; et al. (21 July 2005). "Extreme collisions between planetesimals as the origin of warm dust around a Sun-like star". Nature. 436 (7049): 363–365. Bibcode:2005Natur.436..363S. doi:10.1038/nature03853. PMID 16034411. ^ a b Jones, J. H. (1998). "Tests of the Giant Impact Hypothesis" (PDF). Lunar and Planetary Science. Origin of the Earth and Moon Conference. Monterey, California. ^ Saal, Alberto E.; et al. (July 10, 2008). "Volatile content of lunar volcanic glasses and the presence of water in the Moon's interior". Nature. 454 (7201): 192–195. Bibcode:2008Natur.454..192S. doi:10.1038/nature07047. PMID 18615079. ^ Taylor, Stuart R. (1997). "The Bulk Composition of the Moon" (PDF). Meteoritics and Planetary Science Supplement. 37: A139. Bibcode:2002M&PSA..37Q.139T. Retrieved 2010-03-21. ^ Galimov, E. M.; Krivtsov, A. M. (December 2005). "Origin of the Earth-Moon System" (PDF). Journal of Earth Systems Science. 114 (6): 593–600. Bibcode:2005JESS..114..593G. CiteSeerX 10.1.1.502.314. doi:10.1007/BF02715942. Retrieved 2011-12-10. ^ Scott, Edward R. D. (December 3, 2001). "Oxygen Isotopes Give Clues to the Formation of Planets, Moons, and Asteroids". Planetary Science Research Discoveries Report: 55. Bibcode:2001psrd.reptE..55S. Retrieved 2010-03-19. ^ Nield, Ted (September 2009). "Moonwalk" (PDF). Geological Society of London. p. 8. Retrieved 2010-03-01. ^ Zhang, Junjun; Nicolas Dauphas; Andrew M. Davis; Ingo Leya; Alexei Fedkin (25 March 2012). "The proto-Earth as a significant source of lunar material". Nature Geoscience. 5 (4): 251–255. Bibcode:2012NatGe...5..251Z. doi:10.1038/ngeo1429. ^ Koppes, Steve (March 28, 2012). "Titanium paternity test fingers Earth as moon's sole parent". UChicagoNews. Retrieved August 13, 2012. ^ a b c Belbruno, E.; Gott III, J. Richard (2005). "Where Did The Moon Come From?". The Astronomical Journal. 129 (3): 1724–1745. arXiv:astro-ph/0405372. Bibcode:2005AJ....129.1724B. doi:10.1086/427539. ^ Halliday, Alex N (November 28, 2008). "A young Moon-forming giant impact at 70–110 million years accompanied by late-stage mixing, core formation and degassing of the Earth". Philosophical Transactions of the Royal Society A. 366 (1883): 4163–4181. Bibcode:2008RSPTA.366.4163H. doi:10.1098/rsta.2008.0209. PMID 18826916. ^ Than, Ker (May 6, 2008). "Did Earth once have multiple moons?". New Scientist. Reed Business Information Ltd. Retrieved 2011-12-10. ^ Dambeck, Thorsten (11 September 2012). "Retuschen an der Entstehungsgeschichte des Erdtrabanten" [Retouches on the genesis of Earth's moon] (in German). Archived from the original on 11 September 2012. Retrieved 23 September 2012. ^ Mitler, H. E. (1975). "Formation of an iron-poor moon by partial capture, or: Yet another exotic theory of lunar origin". Icarus. 24 (2): 256–268. Bibcode:1975Icar...24..256M. doi:10.1016/0019-1035(75)90102-5. ^ "NASA Lunar Scientists Develop New Theory on Earth and Moon Formation". NASA Press Release. NASA. 2012-10-30. Retrieved 2012-12-05. Canup, R. M.; Asphaug, E. (Fall 2001). "An impact origin of the Earth-Moon system". Abstract #U51A-02. American Geophysical Union. Bibcode:2001AGUFM.U51A..02C. R. Canup; K. Righter, eds. (2000). Origin of the Earth and Moon. University of Arizona Press, Tucson. pp. 555 pp. Shearer, C. K.; 15 coauthors (2006). "Thermal and magmatic evolution of the Moon". Reviews in Mineralogy and Geochemistry. 60 (1): 365–518. Bibcode:2006RvMG...60..365S. doi:10.2138/rmg.2006.60.4. Galimov, Erik M.; Krivtsov, Anton M. "Origin of the Moon. New Concept. Geochemistry and Dynamics". De Gruyter. , Berlin 2012, ISBN 978-3-11-028640-3. Dana Mackenzie, The Big Splat, or How Our Moon Came to Be, 2003, John Wiley & Sons, ISBN 0-471-15057-6. G. Jeffrey Taylor (December 31, 1998). "Origin of the Earth and Moon". Planetary Science Research Discoveries.